Over the course of one school year, third graders from three different schools are exposed to three different styles of mathematics instruction: a self-paced computer-learning style, a team approach, and a traditional class approach. The students are asked which style they prefer and their responses, classified by the type of program they are in (a regular school day versus a regular day supplemented with an afternoon school program), are displayed in Table 60.15. The data set is from Stokes, Davis, and Koch (2012), and is also analyzed in the section Generalized Logits Model in Chapter 32: The CATMOD Procedure. 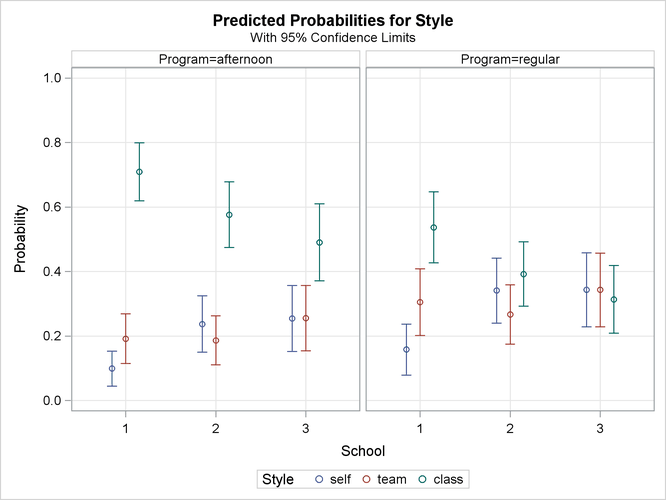 where is the probability that a student in school h and program i prefers teaching style j, , and style r is the baseline style (in this case, class). There are separate sets of intercept parameters and regression parameters for each logit, and the vector is the set of explanatory variables for the hith population. Thus, two logits are modeled for each school and program combination: the logit comparing self to class and the logit comparing team to class. The following statements create the data set school and request the analysis. The LINK=GLOGIT option forms the generalized logits. The response variable option ORDER=DATA means that the response variable levels are ordered as they exist in the data set: self, team, and class; thus, the logits are formed by comparing self to class and by comparing team to class. The ODDSRATIO statement produces odds ratios in the presence of interactions, and a graphical display of the requested odds ratios is produced when ODS Graphics is enabled. Summary information about the model, the response variable, and the classification variables are displayed in Output 60.4.1. Logits modeled use Style='class' as the reference category. The "Testing Global Null Hypothesis: BETA=0" table in Output 60.4.2 shows that the parameters are significantly different from zero. However, the "Type 3 Analysis of Effects" table in Output 60.4.3 shows that the interaction effect is clearly nonsignificant. The table produced by the ODDSRATIO statement is displayed in Output 60.4.4. The differences between the program preferences are small across all the styles (logits) compared to their variability as displayed by the confidence limits in Output 60.4.5, confirming that the interaction effect is nonsignificant. Because the interaction effect is clearly nonsignificant, a main-effects model is fit with the following statements. The EFFECTPLOT statement creates a plot of the predicted values versus the levels of the School variable at each level of the Program variables. The CLM option adds confidence bars, and the NOOBS option suppresses the display of the observations. All of the global fit tests in Output 60.4.6 suggest the model is significant, and the Type 3 tests show that the school and program effects are also significant. The parameter estimates, tests for individual parameters, and odds ratios are displayed in Output 60.4.7. 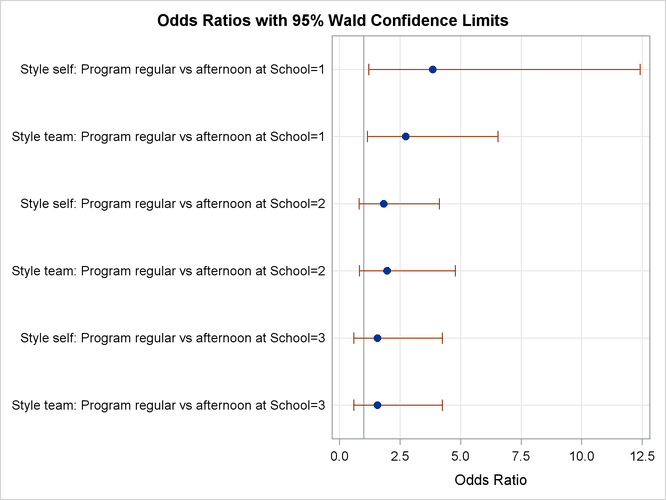 The Program variable has nearly the same effect on both logits, while School=1 has the largest effect of the schools. The interaction plots in Output 60.4.8 show that School=1 and Program=afternoon have a preference for the traditional classroom style. Of course, because these are not simultaneous confidence intervals, the nonoverlapping 95% confidence limits do not take the place of an actual test.